A WordPress website promoting the products and services of a team of physicists supplying the world with optical metrology technologies. 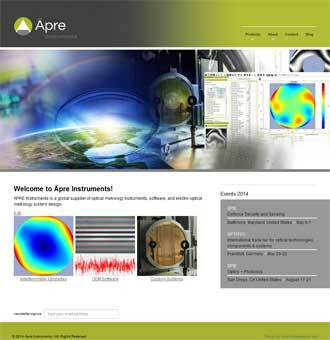 A team of physicists and engineers, that are global suppliers of optical metrology technologies, needed an easy to update website to attract customers via product pages, blog posts and whitepaper downloads. The client also needed to build their customer list by capturing visitor email addresses. The site needed to be fast, secure, and responsive. A WordPress website using the Bootstrap CSS framework was developed based on a graphic design created by Clean, Clear, Creative. The design was delivered as a layered Photoshop PSD file. Custom post types were used for team members, and industry events. Custom pages and templates for the client’s products were created. A system to capture visitor email addresses to MailChimp before whitepaper downloads was created. This website structure and code for the custom WordPress theme for the site was developed over the course of one week. After a brief training session, and working closely with Clean, Clear, Creative, the client was able write blog posts, add content to pages, add products, add events, and upload whitepapers to the site. This work was all done on a beta test site, before live launch. The live site uses a mobile responsive web design and runs on WordPress. The website displays the product catalog, industry events, whitepaper links, and a blog. Visitor emails are captured to MailChimp for an email newsletter via sign up form, or at the moment of downloading a whitepaper. The client can easily update the WordPress website without technical support.